Around this time every year I get horrible cabin fever. I am sick of the cold, the snow, and the lack of sunlight. I spend my days dreaming of green grass, blue skies and endless sunshine. Today was a particularly bad day. The weather was awful. It was freezing cold and the roads were covered in ice which meant I was stuck at home. So to keep my mind off the gloomy day I decided to bake. I have been craving chocolate and raspberry for a while so today was the day I would tackle my favorite sweet and sour combination. After much deliberation I decided to make a rich chocolate layered cake covered in chocolate ganache and filled with a whipped raspberry filling. Since it is the week of Valentine's Day I decided I would make them heart-shaped just for fun. 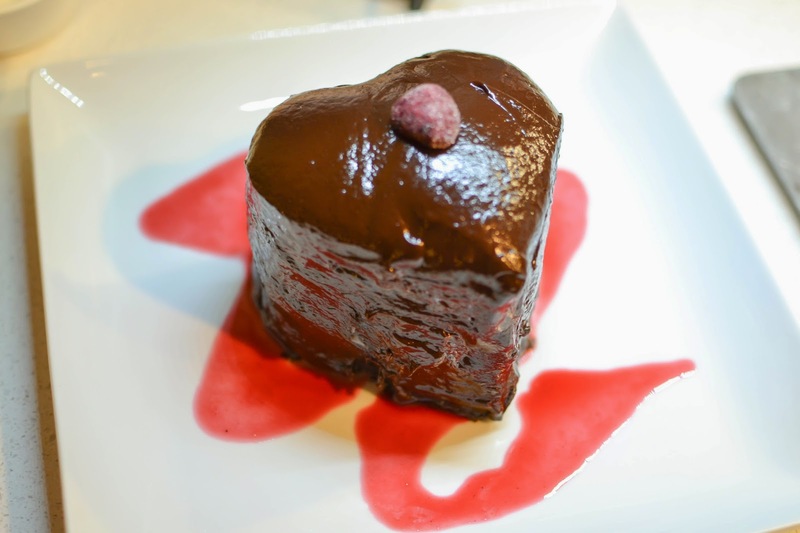 The base of this dessert is an intense dark chocolate cake. 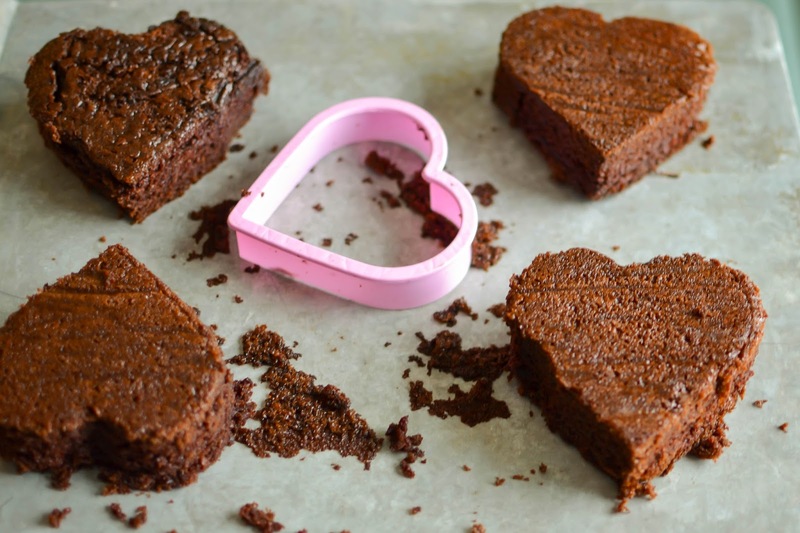 This cake is incredibly moist, with a rich chocolatey taste that can instantly make any day better. 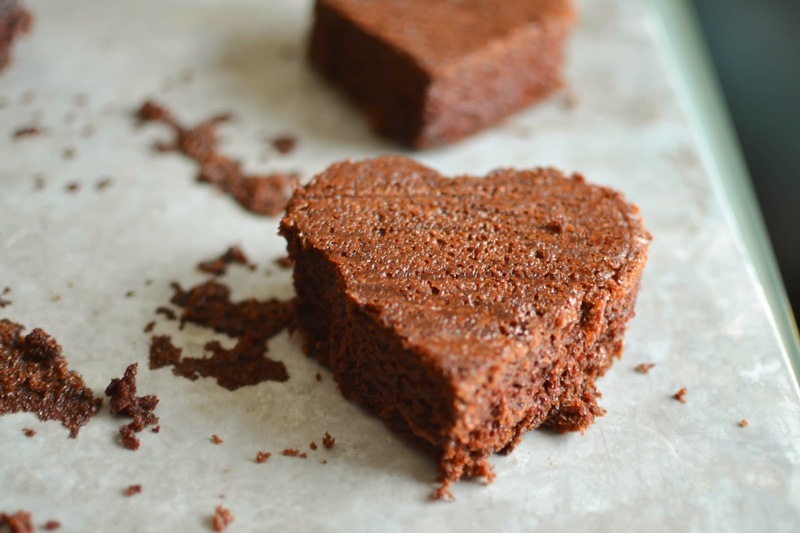 It reminds me of the sour cream chocolate cakes of my childhood, so naturally it is my go-to recipe for chocolate cake. The ingredients for this recipe are rather simple, but you can get fancy with dutch-processed cocoa and Madagascar vanilla beans if you really want to. I on the other hand just grabbed whatever I had in pantry. There was no way I was going to battle the icy roads again just to make a cake. 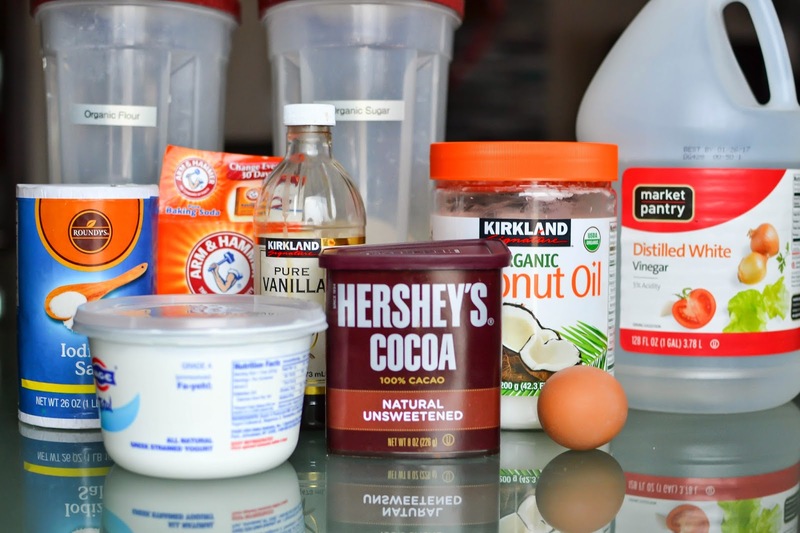 All you need for this cake is flour, sugar, salt, baking soda, cocoa powder, coconut oil (or canola oil), Greek yogurt (or sour cream), vanilla extract, distilled white vinegar, and an egg. Then it is time to get baking. First, you'll want to preheat your oven to 350 degrees and then prepare your pan. I used a 8x8 pan which was not the best idea. By the end my desserts were the size of mini skyscrapers. Next time I will use a 9x13. Grease the bottom of your pan and then add parchment paper. This will help make removal of your cake easy. Then grease the sides and top of the paper, and set your pan aside. Now it is time to start the cake. 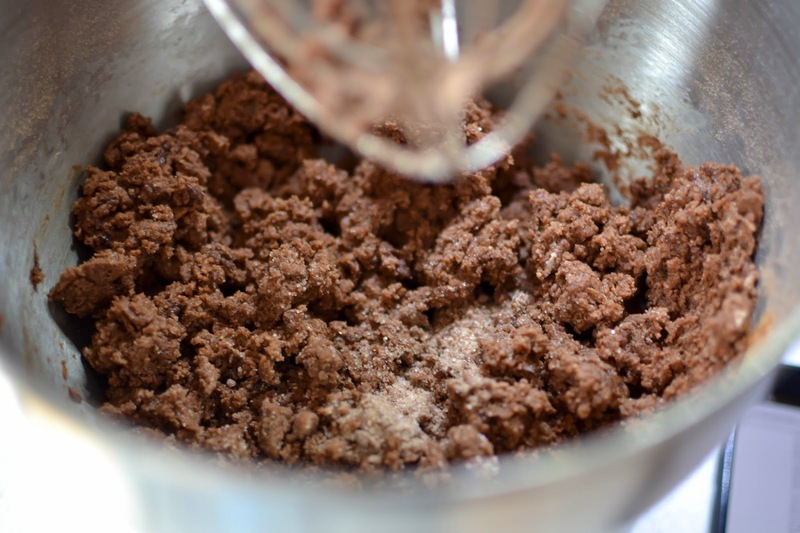 First, you need to whisk the flour, sugar, cocoa powder, baking soda and salt in a large bowl. I used a stand mixer but a hand whisk will do just as good of a job. Next it is time to add the coconut oil and yogurt to the mix. Whisk to combine. If you have never used coconut oil in your baked goods now is a great chance to try it out. Coconut oil, while a saturated fat, is filled with tons of health benefits. It contains medium Chain Triglycerides and lauric acid which help speed up metabolism, lower bad cholesterol, and boost your immune system. Of course too much oil is not good for you either. If you have never used coconut oil it is important to note a couple things. First, it will give your foods a subtle coconut flavor. Second, the melting point is 76 degrees. Therefore, depending on the temperature of your house your oil may either be a solid or liquid. In our frigid 65 degree home my coconut oil was hard as a rock. However, a couple seconds in the microwave made it an easily usable liquid. As I have mentioned previously, I always use Greek yogurt over sour cream. Unfortunately heating the yogurt kills the good bacteria, but you still get the extra protein. It has much more nutritional value than sour cream. Slowly beat in the water. Your mixture will become very runny. Then stir in the vanilla extract and vinegar. The vinegar reacts with the baking soda causing the cake to rise during baking. This ensures a nice fluffy cake. Finally beat in the egg until combined well. Scrape down the sides of the bowl and pour the batter into your prepared pan. Bake the cake for 25-30 minutes until a toothpick inserted in the center of the cake comes out clean. 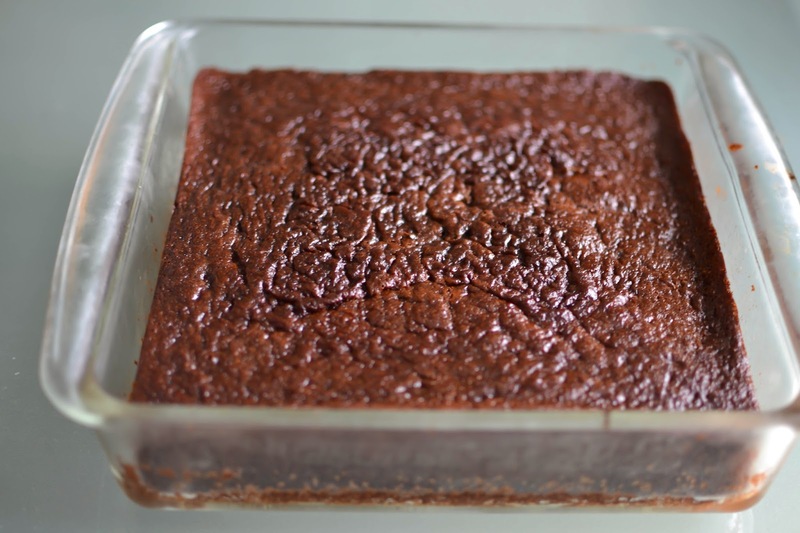 Once baked remove cake form oven and allow it to cool in the pan for 30 minutes before inverting it onto a cookie sheet. This cake is very soft so once the cake was cool I put it in the freezer to firm up a bit before I tried to cut it. 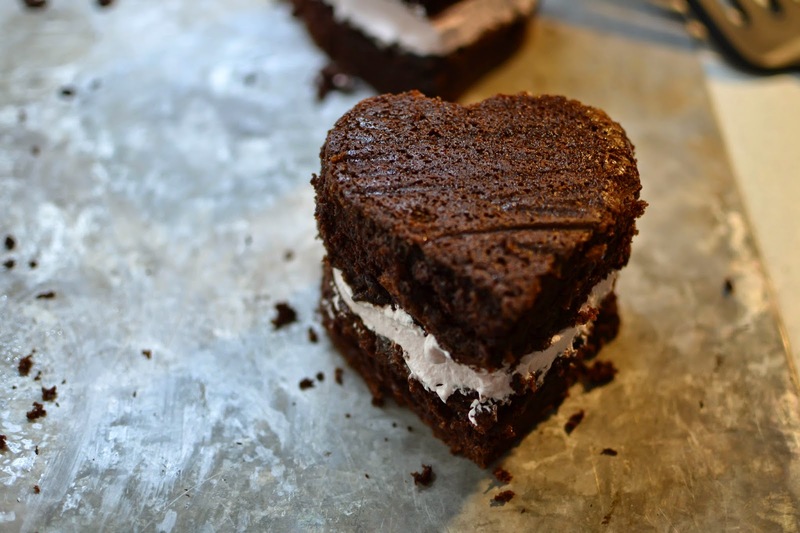 Using a cookie cutter cut hearts out of the cake. I was able to get 4 layers out of my 8x8 pan. Remember that this dessert is incredibly rich and a smaller cookie cutter is probably better than a large one. I used one probably 3 inches across and the cake was way too big for two of us to finish. Once the cakes are cut set them aside and it is time to make the raspberry filling. 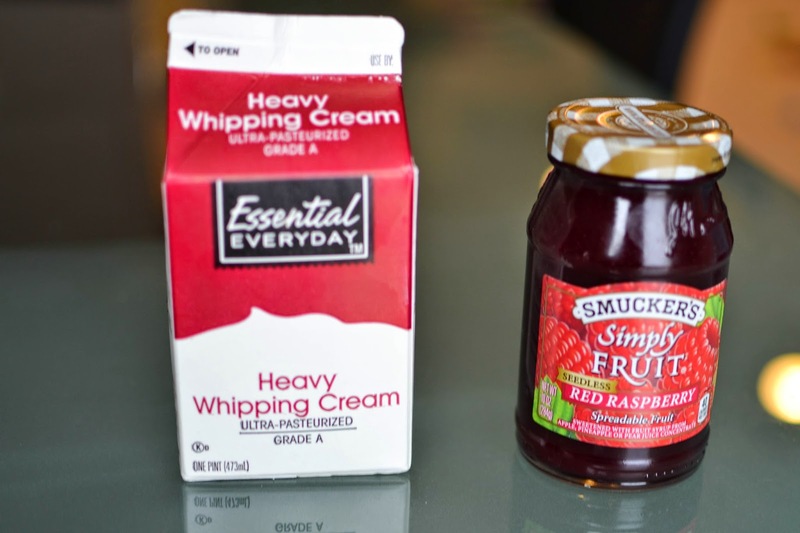 For the whipped raspberry filling you only need two ingredients, heavy whipping cream and raspberry preserves. 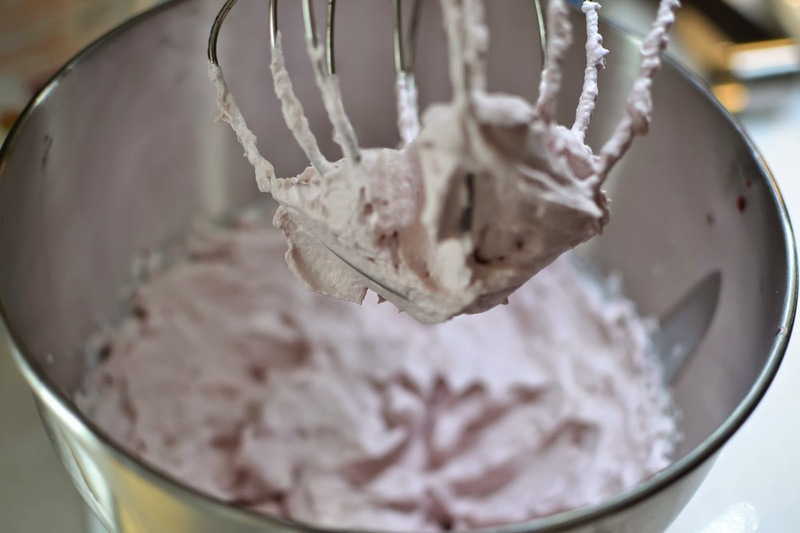 Add 1 cup whipping cream to a stand mixer fitted with a whisk attachment and whisk cream until soft peaks form. Add 4 heaping tablespoons of raspberry preserve. You could add a tablespoon more if you want a stronger raspberry flavor. Whip until stiff peaks form. Using a piping bag fitted with a round pastry tip pipe filling on to half of the cake layers. Top the piped layers with a empty cake layer to create an amazing layered cake. 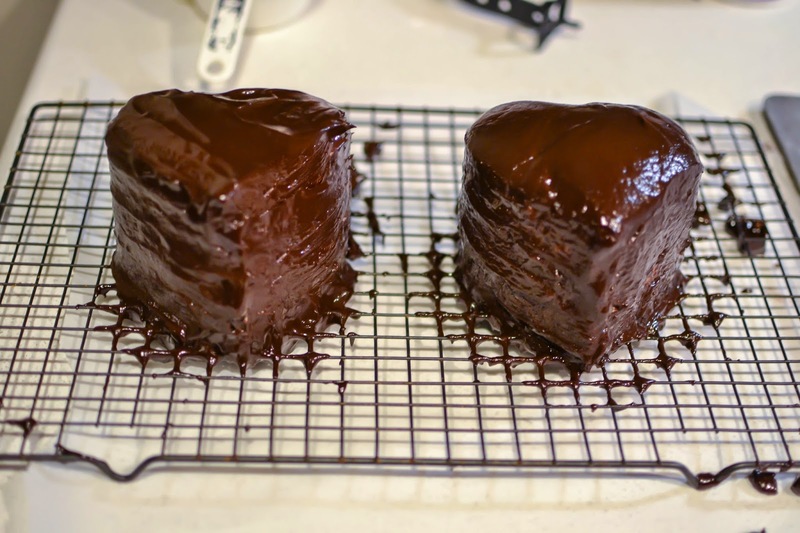 Cover the cakes with plastic wrap and refrigerate while you make the chocolate ganache. To make the ganache you will need sugar, water, heavy whipping cream, milk, and bittersweet chocolate. Add all of the ingredients except the chocolate to a saucepan. Heat on low until little bubbles form around the sides. Then pour in chocolate and let sit for 5 minutes. After 5 minutes whisk until smooth. 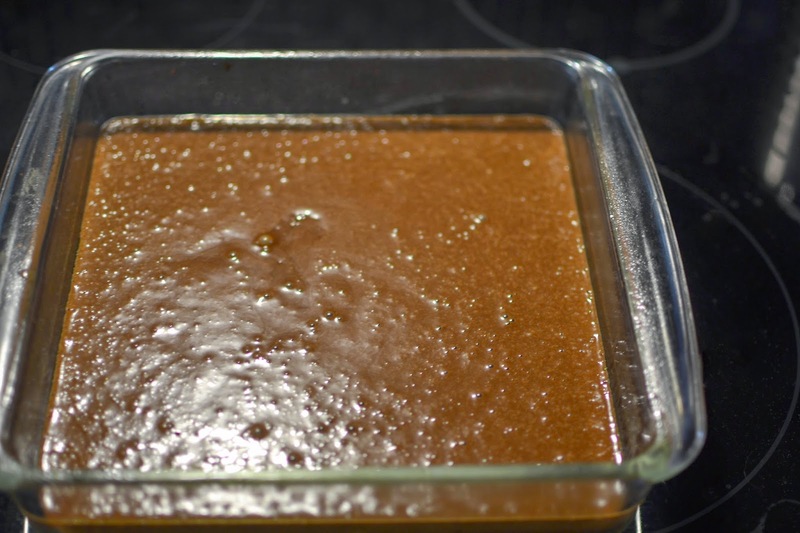 Put some of the ganache in the fridge to use later for frosting and keep the rest in the pot. 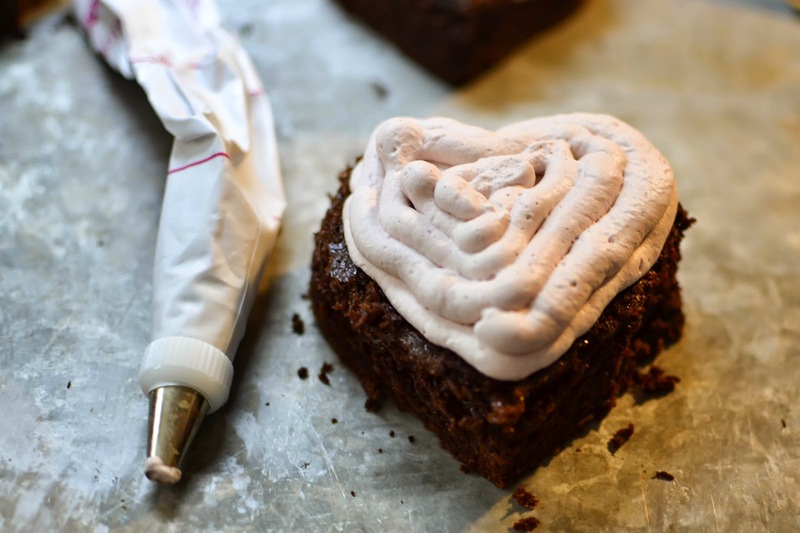 Before you can pour the ganache over the cakes you are going to want to prep your work area. Cover a cookie sheet with parchment paper, this will make clean-up a breeze, and then place a cooling rack on top of the cookie cheat. In order to create a smooth finish on the cakes you will want to used the refrigerated ganache to frost the sides. The goal is to cover the area between the layers. The smoother the sides the better your cake will look. Now it is time to pour the ganache. If your ganache has cooled too much you can heat it slowly on the stove. Be careful not to heat it too quickly or too hot or it may seize up creating a burnt mess. Pour the ganache over the cake starting at the center and working your way out. As you can see my ganache was not quite warm enough so the texture was not as smooth as I wanted. Just for an added touch I also made a raspberry coulis to give the dessert a little more flavor. Simply heat frozen raspberries and sugar in a saucepan until cooked down. Then strain liquid through a small mesh strainer in to a decorating bottle like the one above. Finish off your presentation by squirting some raspberry coulis on the plate before adding the cake. I also added a sugar dusted raspberry just for and added touch. Now it is time to enjoy! Preheat oven to 350 degrees. Grease bottoms and sides of a 9x13 inch pan. 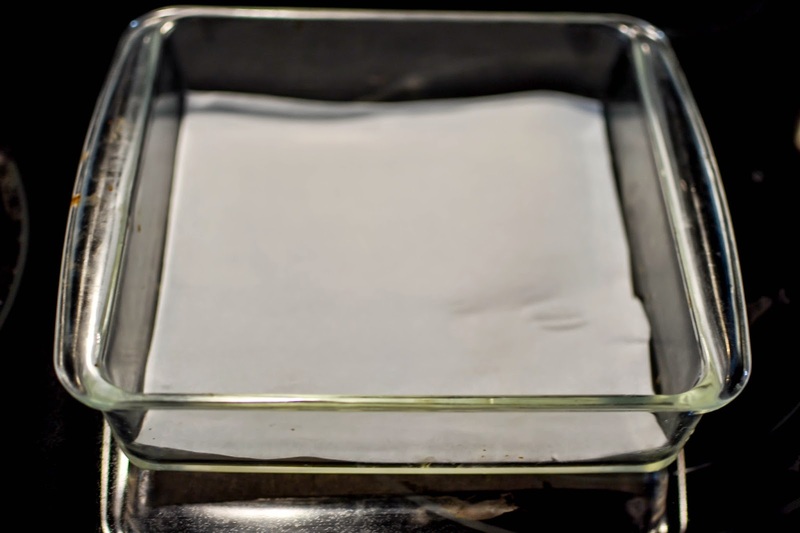 Line the bottom of pan with parchment paper and grease paper. 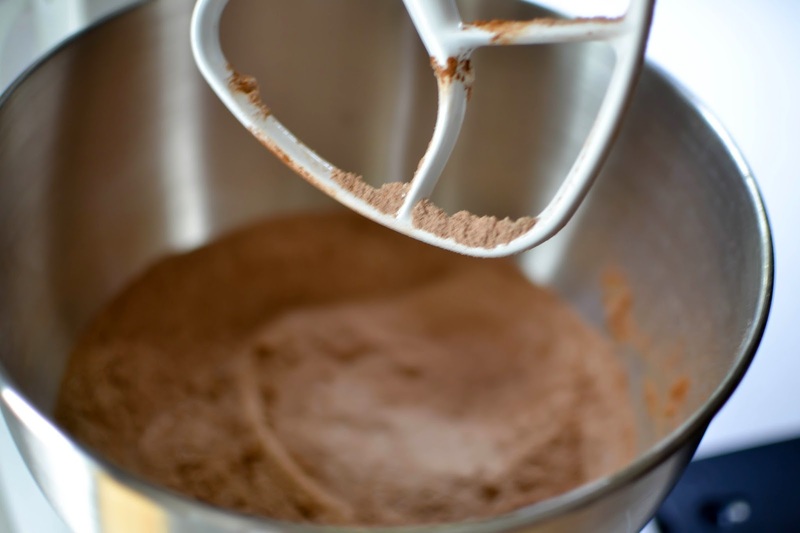 Add flour, sugar, cocoa powder, baking soda and salt to a large bowl. Whisk to combine. Add in coconut oil and yogurt and whisk to blend. Slowly beat in water. Stir in vinegar and vanilla. Whisk in egg until combined well. Scrape down sides of bowl. Pour batter into prepared pan. 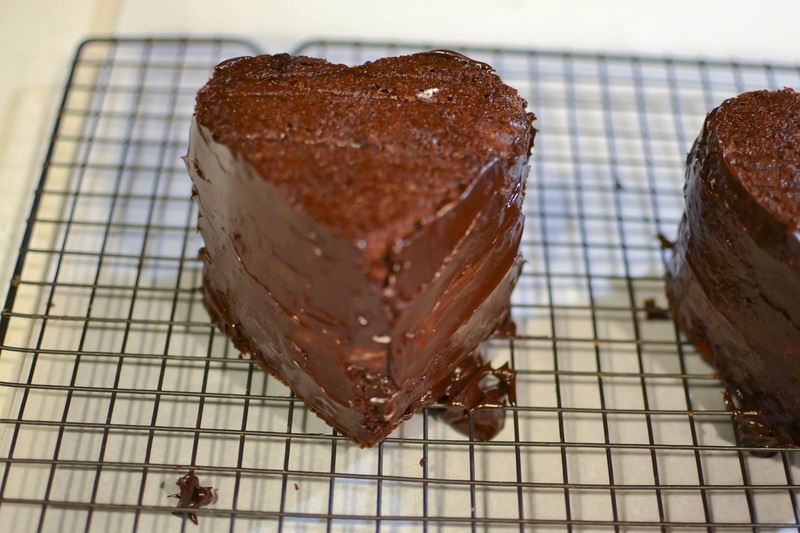 Press a heart-snapped cookie cutter into cake to create heart-shaped layers. Lay aside and make filling. 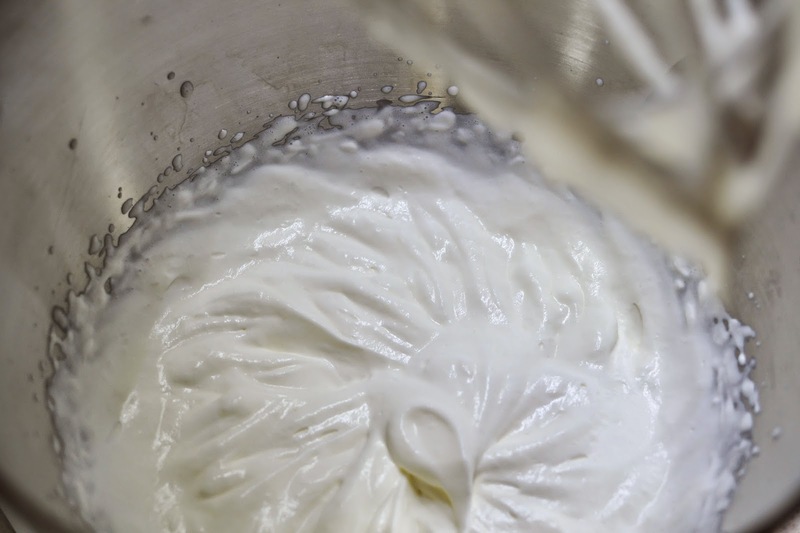 With a stand mixer whip heavy cream until soft peaks form. Add raspberry preserves and continue to whip until stiff peaks form. Fill pastry bag with a round tip and pipe filling on half of the cake layers. Top the cake with another layer. Cover with plastic wrap and refrigerate while making ganache. Heat sugar, water, cream and milk in a saucepan over low heat until bubbles form around edges of pot. Remove pot from heat. Add chocolate and swirl pan until chocolate is covered by cream. Let ganache sit for 5 minutes. 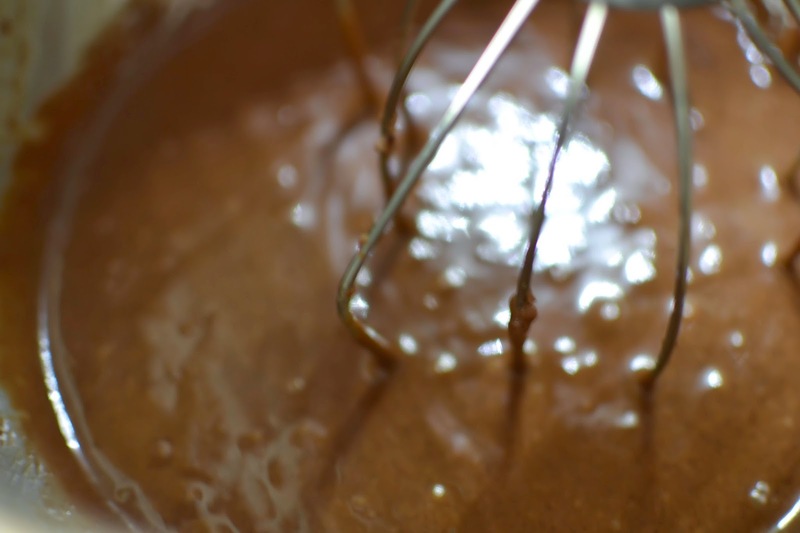 Whisk ganache until smooth. Pour one cup into small bowl. Refrigerate until slightly firm. Keep the rest of the ganache in the pot to keep it warm. 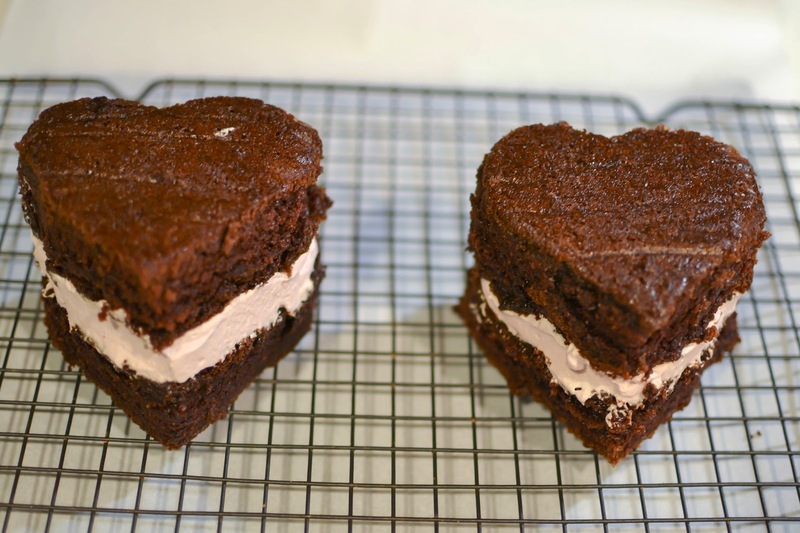 With small offset spatula frost sides of layer cake with refrigerated ganache. Make sure to make a smooth surface between the layers. 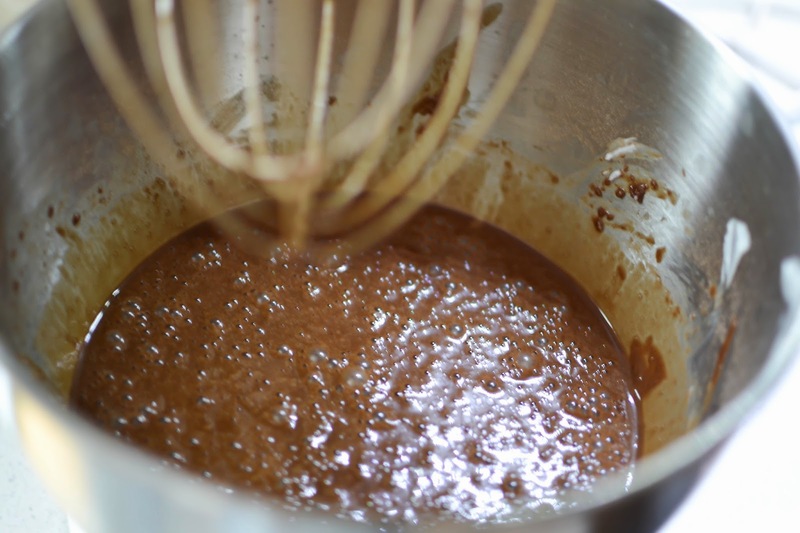 This will ensure a smooth finish when you are done pouring the ganache. Set the frosted cakes on a cooling rack over a baking sheet lined with parchment paper. Slowly pour warm ganache over the cake stating in the middle and working your way out. Check all sides to make sure they are covered. 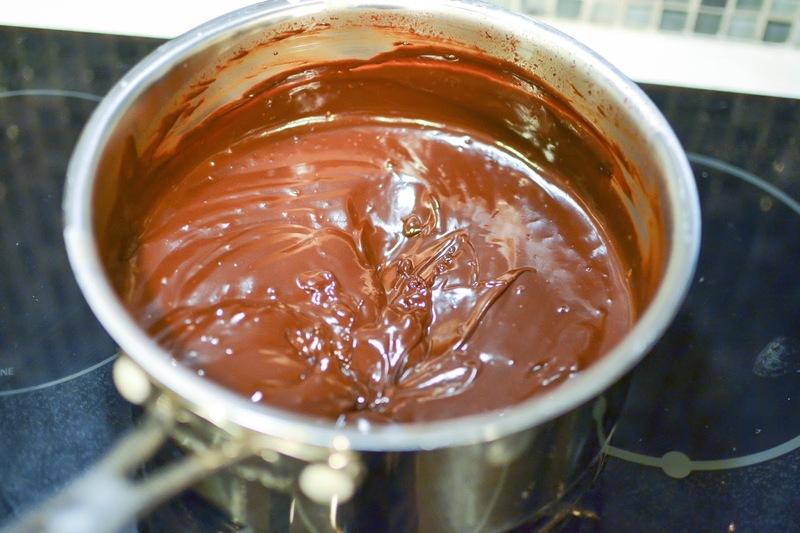 If your ganache is hard to pour heat it on the stove for a couple minutes until it becomes pourable again. Cook raspberries, sugar and brandy in saucepan over low heat. Simmer for about 5 minutes. Stir or use an immersion blender to combine well. Strain sauce through a fine mesh strainer to remove seeds. 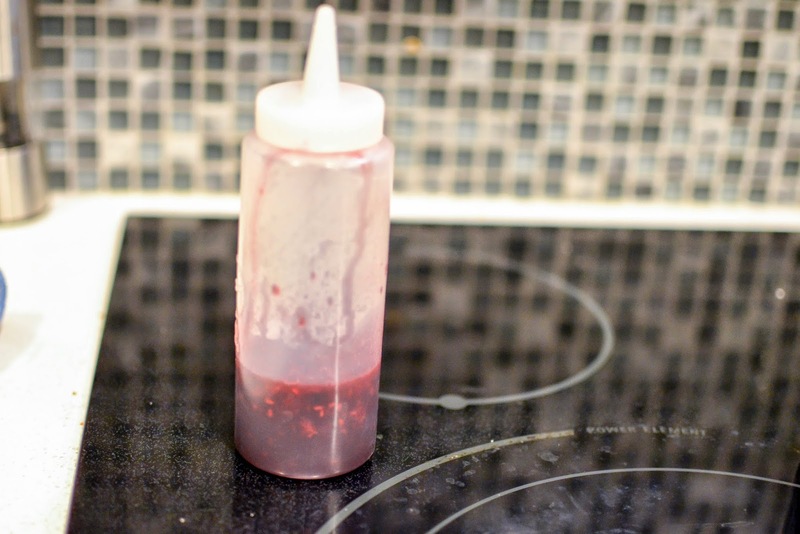 Add sauce to a decorating squeeze bottle. Add a decorative layer of sauce to plate before adding cake on top. Enjoy!